For 2000 years in the Orthodox Church, the tradition has been for women and girls to veil their heads during worship, whether at church for the liturgy, or at home for family prayer time. What is the Scriptural and Patristic evidence for this tradition, and why is it important? In this article, we will take a look at headcoverings in the Old Testament, headcoverings in the New Testament, headcoverings according to the early Church, headcoverings in icons, and headcoverings today. At the end of the article there are links to additional resources for learning about Christian headcoverings. . . . Centuries before the birth of Christ, women’s headcoverings were an accepted practice for God’s people. It was not merely an option for those who wished to be holy. Rather, it was a matter-of-fact expectation that all women would cover their heads. Of course, such a requirement would make little sense, if women did not normally keep their heads covered. Then Rebekah lifted her eyes, and when she saw Isaac she dismounted from her camel; for she had said to the servant, “Who is this man walking in the field to meet us?” The servant said, “It is my master.” So she took a veil and covered herself. Her godly discretion is a model for women today. She did not flaunt her physical beauty. Rather, she veiled herself, increasing her allure through an outward display of modesty. In this passage of Scripture, virtuous people approve of women’s headcoverings and veils, while ungodly men seek their removal. Women’s headcoverings are one of the many points of similarity between Israel and the Church. Godly women had covered their heads for thousands of years prior to the advent of Christ. And when the New Testament Church was born, godly women continued the practice. Every woman who prays or prophesies with her head uncovered dishonors her head. The message is pretty clear: It is honorable for a woman to wear headcoverings during worship, but it is dishonorable for men to wear them. This is why men remove their hats for prayer, even to this day. The woman ought to have a symbol of authority on her head, because of the angels. 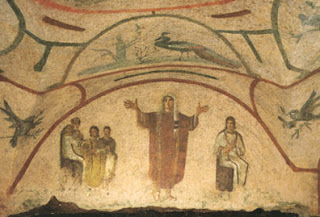 Image from the Catacomb of Priscilla, c. 220 AD. The Old Testament reveals that this holy tradition is ancient, but it only begins to hint at the reasons. Here in the New Testament, we are given some reasons for the practice. According to 1 Corinthians 11, headcoverings manifest a woman’s honor. They also are important “because of the angels”. Angels are present with us when we pray, and when we worship. While we may not fully understand why headcoverings are important to the angels, it is sufficient for us to know that this reason is given in Scripture. If Scripture says that women’s headcoverings are important to the angels, then it is something we should take seriously. Icons in the Orthodox Church are a visual guide to the Faith, a sort of “picturebook” of Christianity. Icons teach us about the life, death, and resurrection of Christ, and about the lives of many Christians who have gone before us. Icons also teach us about headcoverings. 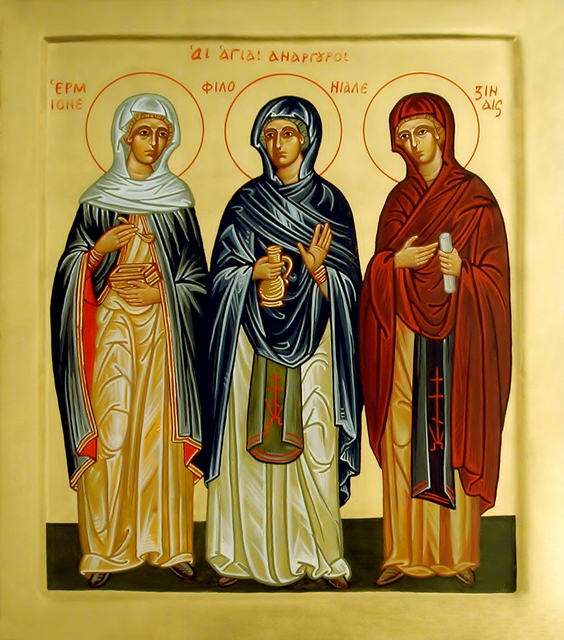 These first-century Orthodox female healers/doctors have come to be known as “The Mothers of Modern Medicine.” All three wear headcoverings. 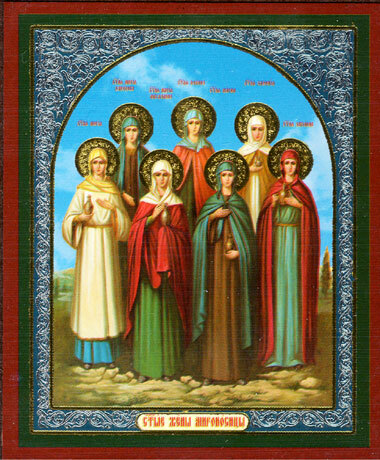 Virtually every icon of an Orthodox woman displays her wearing a headcovering. As far as I know, the only exception is St. Mary of Egypt, and she was a solitary saint who lived alone in the desert, far away from any people. Among the female saints who participated in society, all of them wore headcoverings, and their headcoverings are shown in icons. 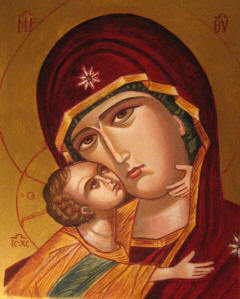 Even Mary the Mother of God–the most blessed woman in the entire universe–is shown in icons, wearing a headcovering. Can you think of a better role-model for women? In our church, all women and girls are asked to wear headcoverings, in obedience to God’s command in Scripture, and out of respect for the holy traditions of the Orthodox Church. Just inside the front door of the church, we keep a basket of headcoverings, just in case a woman forgets hers at home and needs to borrow one for the day. Headcoverings are also worn at home, during family prayer time. Headcoverings manifest a woman’s honor. As St. Paul points out in Scripture, a woman brings honor to herself by covering her head during prayer. Headcoverings encourage humility. Godly women come to church to focus on worship, not to draw attention to themselves. A girl may be tempted to show off an attractive hairdo. When a woman wears a headcovering, this temptation is removed. She can focus on prayer, instead of on hair. Headcoverings save time. In today’s culture, it can be tempting to spend a lot of time and energy on hairstyles. But headcoverings are quick and easy. It takes a lot less time to put on a headcovering, than it does to prepare a hairdo for display. Headcoverings help us show love and consideration for our brothers. Godly men come to church to focus on worship. But the flowing locks of beautiful woman can be distracting. By veiling her hair, a woman can display her modesty, and remove an unnecessary distraction. For twelve years I have worn a scarf [headcovering] at all times. I now perceive that it has been—and continues to be—essential for the pilgrim journey and salvation of my soul. The bottom line for me—and a growing number of my sisters—remains obedience. And with it comes a sense of being in our rightful place in God’s ordered universe, rejoicing with the angels. Now I gratefully say, “I am!” in the presence of the great I AM—at prayer and in church, surrounded by the angelic host, worshipping our Lord and King. To God, Father, Son, and Holy Spirit, be the glory, now and ever and unto ages of ages. Amen! This entry was posted in Headcoverings. Bookmark the permalink. I appreciate this article quoting passages from the old and new testaments; however,I do not appreciate that Daniel 13: 31-33 is a quoted biblical source. The book of Daniel does not have a chapter 13! In older copies of the King James Version (KJV) of the Bible, instead of including the Story of Susanna in chapter 13 of Daniel, the KJV includes it in a separate section. In the Orthodox Study Bible (which is translated from the ancient Septuagint copies of the Scriptures), the Story of Susanna is included in the very beginning of the book of Daniel. Even though different Bibles include the Story of Susanna at different locations, rest assured that it is a wonderful part of the Holy Scriptures. It surprises me that Orthodox would ask you this? I just assumed all Orthodox were women in dresses only with head coverings standing on the left, men on the right with long sleeves only. I have only been Orthodox for 4 years, but I guess I dont get out to other Churches much. Note that man is the image and glory of God, while woman is glory of man. She is not the image of man, she shares the image of God with the man. However, in the order of creation the man is the first, a product of God’s direct creation, and the woman came second, from the man. That is why she is described as the glory of the man. St. Paul later points out that equality truly exists, because though woman came originally from man, all men eventually come from a woman. And woman with long hair? Saint Paul said that long hair is a veil. very clear.. I am often baffled that people can’t discern two different coverings in Paul’s writings. I am an Orthodox woman who grew up in the ’60’s & ’70’s when women quit wearing hats & head-coverings to church. What I struggle with today are young women who wear any variation of high heels, sheer hose, a short, possibly tight dress, or tight pants, a shirt revealing décolletage, and make-up ………. with a head scarf. This is a recurring problem in our church community. The modesty & humility of the head scarf begins at the top of one’s head, and should go all the way down to one’s toes. Young women should be aware of the distraction they can be to the men of the parish (and that distraction does not end with their hair). Amen! I agree with you 100%. Stephanie, I would say that the guidelines are specified when one goes to an Orthodox monastery. At pretty much every parish church I’ve attended, it is up to personal discretion. I think the description of “Mary-like Modesty” has a very good image of what should be expected. (I’m passing this on to my husband!) Thank you! Presbytera, I have only been Orthodox for 4 years. I go to a fairly conservative old calendar Church and I have to agree. What is the point of the head covering (not to dismiss it of course) if the rest of the attire is potentially distracting to men in the Church. (just being frank and honest here) especially since I have a teen age son serving in the altar. It is not the responsibility of women to keep men’s thought on their prayers in church. This is a very dangerous and potentially harmful approach to women. This sort of “the way she was dressed made me do it!” is a far too common legal defense in our culture in cases of violence against women and is especially common in Muslim cultures where burka clad women are irrationally accused of provoking men’s desires, and hence, violence against them. Men need to be taught to keep their eyes to themselves and evil thoughts against women under control and not to blame the women around them for their behavior. Julie, it seems that you are basically saying, “I am not my brother’s keeper.” Sounds like the lament of Cain in Genesis 4:9. On the contrary, Scripture and the Church constantly remind us that we *are* our brother’s keeper. Love requires it. Specifically to the current point, Scripture requires women to dress modestly, and openly rebukes women who lack discretion in the way they dress. It is true that no one has a right to violate women. Anyone who does that is guilty, and should be dealt with accordingly. It is simultaneously true that a measure of guilt is borne by the woman who dresses provocatively. If you advertise, then someone will respond to your ad. If your manner of dress manifests a lack of charity towards your brother, then you are not innocent. Man can have long hair? Here, in Romania, I saw lots of times women being very preoccupied with headcovering in churches but having no problems in wearing pants in there. Is it more important for a woman to have a headcovering than wear a skirt? My personal opinion is either you dress with all the uniform (headcovering and long skirts), or else you go with no headcovering and with pants. I think you bring up a good point. When Holy Scripture calls us to modesty, certainly that applies to the entire wardrobe, not just to headcovering alone. Thank you for this post. As a covering woman, it is always good to know I am obedient to God, Scripture, the Fathers and Tradition. Magnificent article. Thank you and God bless you! What about hair dye? Specially on 70-something old ladies, whose hair is red, blond, or pitch black, and the thought crosses my mind, quite involuntarily, about whom exactly is she kidding? I feel I have earned every one of my gray hairs! Why is it that nobody ever says anything about coloring hair? Good point, Lana. Throughout Holy Scripture, God praises gray hair as being a good and glorious thing. There is no good reason to cover up that glory with dye. I look forward to having grey hair myself one day. So are we to understand that all monastics, clergy including bishops, archbishops and patriarchs are incorrect in wearing klobuk, kamilavka, and mitre? I asked my priest about this. He said there are set times during the liturgy during which the hats have to be removed. He said the hats symbolize the teaching office, but that they are frequently removed for prayer. So…..are there times when woman should remove their headscarves? Also, I will note that in the traditionally Orthodox lands of Slovakia and Eastern Poland most middle aged woman and younger do not wear head-scarves. At our church, the women all wear their headcoverings in church during the liturgy, and they also wear them at home during their daily family prayer times. I also know of some women who wear their headcoverings 100% of the time, in response to St. Paul’s plea to “pray without ceasing”. At the very least, it seems that women should cover their heads during times of corporate prayer. You are correct that, unfortunately, modernism has crept into the Church over the past couple generations, and a number of women have stopped wearing headcoverings. This is something for us to grieve over, and to repent of. Dr Gleason, may we use portions of this article in a tri-fold brochure to have available in our teaching rack? We will note the URL and credit you as author. By all means, feel free to use the information to make brochures and teaching resources. Thank you for the encouragement! Father Deacon: I was once a clergy wife in our Church (not in your jurisdiction) and used to catch heck from our Bishops at the seminary about even daring to wear a headcovering in the chapel or services or elsewhere. They said I would confuse the people by “looking like a nun or a moslem” even though my headcovering was not black. But I dared wear it as best I could, and seeing me wear it, then they began to criticize if the sleeves of my shirt were rolled up during prayer by mistake. Now 20 years later, nobody talks about “should or shouldn’t” as far as a headcovering is concerned anymore. If you wear it, you aren’t criticized; if you don’t wear it, you aren’t criticized. But most women don’t study the depth of what Paul is saying (as you illustrated above.) Since I earned battle scars from the Hierarchy, I openly ask – why shouldn’t Bishops take the time to present to groups of women the historical facts? The headcovering first began to be exempt from Church services from about the time women earned the right to vote in America, along with bobbed hair. It was a purely secular fashion trend, after which followed more and more nakedness each decade. Isn’t there a way the Hierarchs could reestablish a blessing for this to assure women that they are doing the right thing? Those in the Middle East, whether Moslem or not, seem to have no problem covering their hair at all! I agree it would be great to hear something from the Bishops about it like as you mention, to officially encourage it. Would you please suggest websites where I could buy headscarves for church? Scarves are available at local stores like Target, Walmart, and the high end department stores. A Google search for head coverings pulls up a plethora of sites. It really depends on how you want to cover your head. The Amish/Mennonites have lovely caps. Women in our church cover with regular hats! Nice article. One thing though that doesn’t make sense in modern practice is that traditionally, women wore headcoverings whether they were in Church or not. This is reinforced in some Patristic statements, as well as by St. Paul’s statement that refers the practice of headcoverings “on account of the angels”. This is a statement concerning the order of creation. Do we really think that Angels are present in a temple but not at our jobs, or in the streets? Icons abound of women covering their heads in public settings. I think the implication of this is that headcoverings have less to do with what women should be wearing in Church, and more what they are supposed to wear in general. If a woman does not cover her head in public, but then does so in Church, what are we saying? That the symbolism and modesty of the covering applies in Church but not at the office or at the grocery store? Let’s be consistent. I think you make a good point. Scripture and the Fathers make it clear that women should wear headcoverings during prayer, and during worship. And if we are always in the presence of angels, and if we are supposed to be in constant prayer, then it would make sense for headcoverings to be worn in public too. I would not be opposed to the idea. It would be interesting to take a close look at the writings of the Fathers, to see if they had occasion to address this particular point. 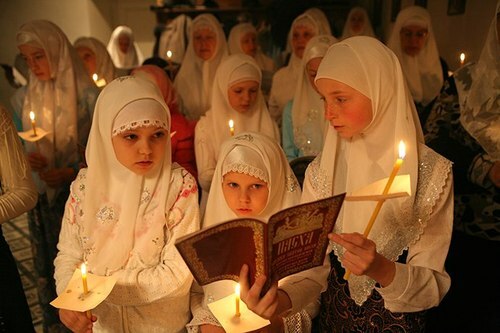 Looking at the photos, I’m wondering,in what part of Russia do even little girls where hijabs? According to St. John Chrysostom, Christian women are to cover all their hair all the time, but does that include the neck too? A very fine article explaining why Orthodox women wear head coverings in church. Hi Samrawit. Maybe you could talk to a priest for guidance; different churches have different traditions. Generally, middle eastern and African churches ask women to cover their shoulders. Coptic and Russian Orthodox churches expect women to wear scarves over their heads. 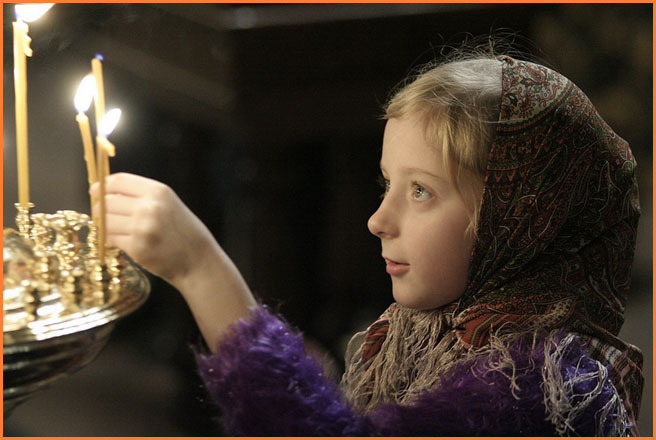 Russian Orthodox prefer women to wear skirts. Not all churches are as traditional though, which is why it may be best to ask the priest of the church you’re interested in. Thanks for the valuable information, I really appreciate this article . I see Orthodox women with headcoverings and I do understand the purpose for that, because it’s the same in all religions and specifically in Islam . The Quran says ” Say to the believing women that: they should cast down their glances and guard their private parts (by being chaste ) and not display their beauty except what is apparent, and they should place their khumur over their bosoms…”( 24:33) “Khumur ” is the plural of “khimar” that means a headscarf . The covering here applies on the head and the bossom. ” except what is apparent” is interpreted by Muslim scholars as the face, the hands and the feet. In an other verse we read ” “O Prophet! Say to your wives, your daughters, and the women of the believers that: they should let down upon themselves their jalabib.” The last word “jalabib” is the plural of ” jilbab” that stands for a long and wide dress. So prudery is recommended in all religions. the Godless secular world of today HATES any sign of the sacred or modesty in females — of any age! I started wearing a black scarf over my long blonde hair and cannot believe the rude comments I’ve gotten over the years…. but a few really love it. We recently joined the Orthodox Church. I would love to see my wife follow the tradition of head covering. I don’t know how to convince her to do so however as many in the church we attend do not cover, and it doesn’t seem to be an issue with them. Share this blog and the scriptures with her. Some women do not want to stick out by wearing a headcovering, especially new members. She might feel it draws attention to her that she really doesn’t want. All the Russians cover. The Greeks do not, except in Greece when they go visit monasteries. I shake my head. If they can cover when they visit a monastery in Greece, why, oh why, can’t they cover in America? Your wife has to want to do this for her spiritual life not for yours. Pray for both of you to accept where she is in the Lord. Kate, weren’t Greeks were under Muslim rule for centuries? The women may have been forced to cover and now have an aversion to it, but I’m just guessing. Then again, it could be that old country/city dichotomy where country women are more conservative than the more fashionable city women. I’ve heard that even in the villages in Muslim countries both Christian and Muslim women wear hijab. Tradition has a real strong influence on head covering and that’s hard to buck! Not just Muslim, but Jewish traditions also still influence Christian head covering. In some Slavic countries married women traditionally must cover but girls and unmarried women do not have to. Muslim and Jewish women cover as submission to God, but modesty and even more, sexuality play a huge part in it.Even for Christian women, it is very hard not to conflate modesty, sexuality and submission to God. Of course, we can always imitate the Theotokos…but there are two Russian icons of the Theotokos with her hair uncovered and the reasoning appears to be cultural. But to be fair, head covering is a discipline to bring one closer to God and to respect the angels. The Theotokos is as close as a human being can get to God AND she’s “greater in honor than the seraphim and beyond compare more glorious than the seraphim” so she has possibly even outgrown the need for head covering. To complicate things even more, the Church Father par excellence John Chrysostom, under St. Paul’s influence, stated that women cover their entire head all the time (neck too?) not just in church, (because of the angels), but few women are going to do that now because they most definitely do not want to be mistaken for a Muslim woman. So we’re back to not wanting to be mistaken for Muslim women…again! I don’t think many non-monastic American women would be called to wear a head covering outside of church though, that would be too hard. All that to say that reading scriptures about head covering is just the tip of the iceberg! On the other hand, American women have the luxury of pretty much redefining head covering tradition in this country if they’re willing to break free from old country traditions. That said, wearing a scarf in church for a few hours a week (and while praying and reading scriptures) should be a piece of cake, but as you wisely alluded in your advice to Rob, head covering is such a personal, intimate decision for a woman that it is really important that she not feel pressured into it. Otherwise, the spiritual benefits of humility and a feminine sign of obedience to God would be smothered by resentment. Oh, one more thought. If a woman finds herself in a church where the priest or bishop state that women must cover in church (Russian) and she is drawn to that church, then maybe that’s God’s way of telling her that she needs to cover in church. If so, take advantage of it! I’d love it if my church said women had to wear head coverings, but I don’t want to stand out from all the other women (the rest of whom have been Orthodox longer than I’ve even been a Christian) by taking it upon myself to do something like that on my own. I feel like it would be like trying to seem like I am better than them or something. Sam, if you feel called to wear a scarf just try it out at least once. It helps to associate the scarf with prayer and then pray and be present as intensely as possible during the whole service. That way it becomes an aid to prayer and really justifies wearing it based on that reason alone. When you see someone with their prayer rope during service do you think they are behaving as if hey were superior to you? Probably not, so think of the scarf the same way, an aid to prayer. My priest said it was about whether it was appropriate to do, not a commandment. He said that in the American culture, it is not appropriate, but in others, it is. Did your priest say what makes it inappropriate in American culture and appropriate in others? It is a sin not to wear a headscarf in church. A demon cried out during an exorcism that he hated it when women wear scarves. Saint Cyril of Alexandria said that the angels cannot bear it whenever a woman’s head is uncovered in church and prayer. – it reminds me to be humble and that I am under authority. I wrestle frequently with pride and vainglory so need the reminder. – if the front sides come past the sides of my eyes, the headcovering reduces or eliminates many visual distractions. It also shields me from curious eyes at times when I may be crying over something from Scripture or the service that has touched my heart. – I use a long and fairly wide scarf of pashmina (winter) or lightweight rayon (summer) with the ends crossed in front then flung over each shoulder. These stay on better than cotton or slippery fabrics and don’t fall off when doing metanias or prostrations as hats tend to do. I find that if the scarf is long enough the weight of the ends will keep them over the shoulder without falling off. If necessary a bit of discreet heavy fringe of one kind or another helps with scarfs that are a bit too short. – Though I love lace mantillas I don’t wear them in church as the idea is to cover one’s hair so having a see-through lace scarf that draws attention to it is counterproductive, just as is having a fancy covering of which one is proud, or that causes one to constantly wonder whether anyone is admiring one’s covering (vainglory). – headcoverings should not be fashion statements If people around you constantly compliment you on your headcovering review prayerfully as to whether that particular scarf has become a snare to one’s spiritual life and the development of Christ-like character. – Sources: besides local stores hotel gift shops often have suitable scarfs, as do Orthodox Jewish websites. – On how much to cover, one Jewish guideline for modest necklines that I’ve found helpful was to place one’s hand palm down, resting naturally against the neck in front. Anything below the little finger should be covered. In Orthodoxy Christianity there is moderation in many things including headcoverings. Be sure to talk to your priest about headcoverings, either way. Laura, thank you for your excellent input! Nothing vainglory about lace mantillas — nothing wrong with a thing of beauty — its your attitude about it. Church veils with a sheer fabric over cross at Easter. How often are you washing your hair to be clean from a dirt and germs? Cover hair when is cold or rain! Live is continuous adaptation to a different environment conditions and what else? I always thought that since woman was made from man, and not from clay, that she was merely a treasured aspect of mankind that is purposely protected and revered as co-creator of more human beings. Equal before God and made in His Image. If she, in this miraculous biological way, is the glory of man, then she should not be standing boldly before God in all her glory with a confused purpose at prayer. Nor should she be competing for the attention of others who are rightly attending to God as well. Rather, when before God, she, the ornament and jewel of mankind, should take a step back and express humility on behalf of mankind. I imagine the angels would not like the woman to compete with God for glory. I think that women should take care to dress so as not to compete for attention in God’s house or anywhere where the aim of attention should be on God’s presence. I notice that women are commanded in scripture to respect their husbands. What is the need for the reminder if it would be a naturally easy thing for a woman to do? Why would this be a common temptation for a woman to avoid? Women are favored with childbearing and attending to the more delicate spiritual work of making icons of their children. This is indeed an exalted occupation which requires the strong resourcefulness and protection of the head of their house. I read in my bible it says women should cover their heads full time out of respect. I do this, but is it wrong? No it is Not wrong — do what you wish — but in church it IS a good thing but women are free Not to do it too. I am new to Orthodoxy, and attend the Divine Liturgy at a ROCOR Monastery. A good number of women wear headscarves, but yet a lot also don’t. What I find funny about it is that more of the older women, than the younger women don’t wear them. But, today I noticed that one of the younger ladies that normally wears one, didn’t wear one today. I am surprised that being a Monastery for Priests, and Monks that the headscarf rule is not mandatory. One Sunday a male parishioner was wearing a tank top, and was told that he needed to wear a proper shirt and rightly so. Whatever you wear folks do one thing: DO NOT VOTE DEMOCRAT if you’re American!! It is the party of hatred toward Christ – the Bible – man/woman marriage etc, Forget about perfection – TRUMP is our only hope. Go Trump!! I wish to conspire with like minded folks how we can win over those poor souls who don’t get this. It’s not easy. I think an article like this may demonstrate at least that our intention is not to lord it over women, but simply to draw their attention to the scriptures and what is truly the tradition of our people as well as how this has been undermined by unfriendly personal and ideological forces. As we would in any matter of health and safety. Thus I contemplate inviting the husbands in our community, to consider this. Anyone conscientiously opposed to this could be invited to produce convincing statements/articles to the contrary. I tried to do an honest search for it, but found nothing so far. Timing may be a key factor, when should this be brought up? 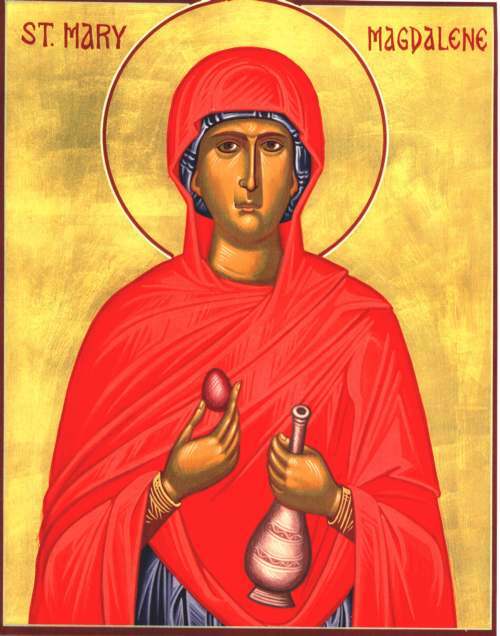 Perhaps at a time when a woman saint is celebrated, such as the Sunday of Myrrh Bearing women.